Subscribe electronically and receive full access to our archives on Project Muse ($60 for a one-year subscription), or sign up to receive our quarterly issues in print ($50). For more information on individual as well as institutional subscription options, visit our subscriptions page at Johns Hopkins University Press. "The Journal of Democracy is far and away the most important forum for current debates about the nature and spread of liberal democracy around the world, and an indispensable tool for anybody interested in comparative politics or international relations. It is a model for how to present serious intellectual content in a clear and accessible way, and a standing rebuke to both the slop that often passes for political journalism and the irrelevant gibberish that often passes for social science." "The Journal of Democracy has shown a consistent devotion to high standards of scholarship in its efforts to promote an understanding of what makes democracy work and what makes it fail." Cited in the New York Times, the Wall Street Journal, and the Washington Post, Journal of Democracy is an influential international forum for scholarly analysis and competing democratic viewpoints. Its articles have been widely reprinted in many languages. Focusing exclusively on democracy, the Journal monitors and analyzes democratic regimes and movements around the world. Each issue features a unique blend of scholarly analysis, reports from democratic activists, updates on news and elections, and reviews of important recent books. 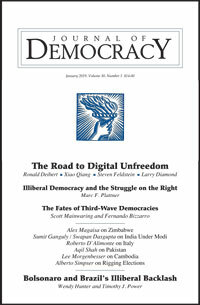 The Journal of Democracy is published quarterly in January, April, July, and October.